Mother Georgia was keeping a watchful eye on the city, as she had been since 1958, looming in the background over Tbilisi. She seemed reassuring from afar but up-close she was more of a giant monster than anything. She held a bowl of wine in one hand, to greet Georgia’s friends, and a sword in the other hand, to deal with enemies. I dreaded that her sword would come and strike me as an enemy if I ever dared say out loud how I really felt about her and therefore decided to step aside. Having read in my guidebook that there was a pathway leading from her statue to the Mtatsminda Park, I went looking and saw of a flight of stairs that no one seemed to use. There was indeed a pathway upon the Sololaki hill, where the rumours of the crowd vanished and only the sound of fluttering tree leaves remained. 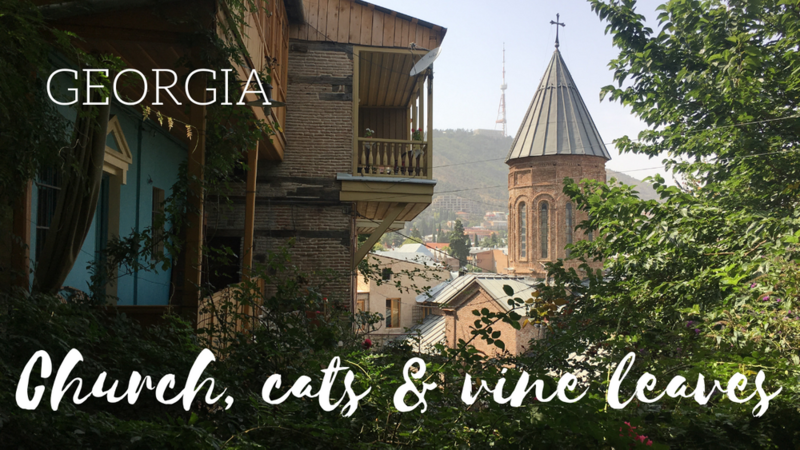 Even though the city was down below, it seemed to me for a moment that I had left Tbilisi altogether. Yet, the worn-out balconies and quaint streets were not too far remote. After a walk that took forever, I caught sight of what looked like civilization all over again, in the shape of colourful houses whose wooden balconies seemed dangerously close to falling over my head. An old lady stopped by my side and, expecting me to be Russian just like every other tourist in town, started asking me questions. I dug deep into my memory, trying to catch glimpses of my high-school Russian lessons, but she caught up on my act fairly soon, not that it did stop her from trying to have a decent conversation nonetheless. As she had grown tired of this monologue, we parted and I went the other way, not really knowing where that would lead me. The streets I was walking through looked familiar. I had seen these intricately carved bay windows on the upper floor, these balconies hanging on the façade of every building. Yet, contrary to the old historic center where colours were as bright as if they had been painted the day before, these balconies were supported by makeshift beams to keep them from falling apart and their colour had faded. I eventually reached the side of the Kura river, which was the first clue as to where to go next. Yet, being clueless wasn’t all that bad, which made me turn right and left in every street I deemed interesting instead of keeping it straight. All around me, buildings looked like they were on the verge of collapse but had managed somehow to hold themselves together, through wooden crutches or sheer will. Paint had started chipping on most doors, replaced in some places by graffiti. The extraordinary thing was that there was beauty in this dilapidation, rough but enticing. The fierce look on Mother Georgia’s face up on the hill took me by surprise as I emerged from a back alley, leaving patchy ground for a flight of stairs leading to a church. I had been long enough in Georgia to reckon that there was a church to be discovered at every corner and this one didn’t particularly stand out. Besides, it was closed. Yet, it felt at peace. A pack of kitten suddenly sprung from the back of the church, teasing each other, rolling on their backs and then running away. Of course, I had to follow them. 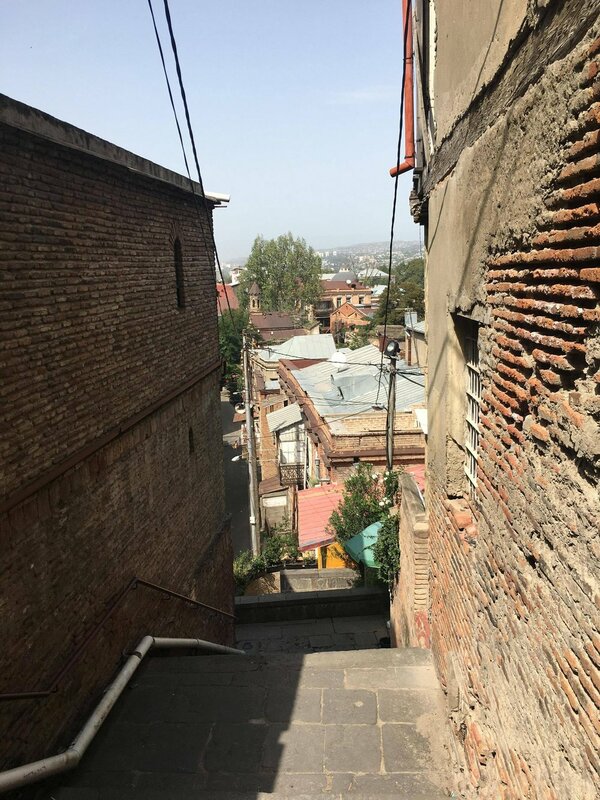 They took me to a small square, where I could hear the bells of another church and take a look of the historic city down below, which made me realize I was much closer to the heart of the old city than I thought. The atmosphere alone of Bethlehem, as I learned the neighbourhood was called, was more akin to that of a village on its own right, secluded from the main city. I stopped next to an ancient Zoroastrian temple, which the cutest kitty of the pack had decided to go explore. He was now playing hide and seek under vine leaves hanging from that nearly destroyed building and I came to notice a pattern. Above all doors were vine leaves. The arches that had covered my head like a blanket in the streets were vine leaves. Everywhere I looked, grapes were growing freely, as if the neighbourhood as a whole was a public grapevine. 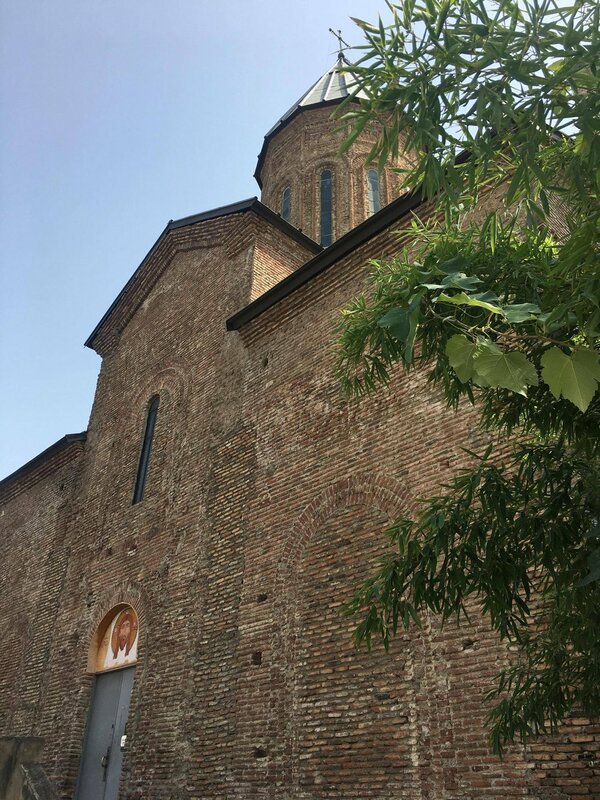 Perhaps every one of its inhabitants was manufacturing its own wine too, honouring the tradition and taking on the mantle of Mother Georgia’s to greet every visitor with a cup of their own concoction. The rest of my travel in the country would prove me that I wasn’t probably far from the truth. For now, Bethlehem was just a tiny part of Georgia but one that I felt grateful to have discovered.